Over the past few weeks podcasts have become my new obsession. I’ll admit it started because I was looking for something to listen to in-between Serial episodes (If you don’t know what I’m talking about stop reading and start binge listening to it immediately!). One of the podcasts I stumble upon is Strangers. Though it’s not my favourite, I quite enjoy it and the latest episode (called Mind Shaft) blew me away. The host, Lea Thau, interviews Greg O’Brien, an investigative reporter diagnosed with early-onset Alzheimer’s. Greg shares what’s it like to experience this horrible disease from the inside. He describes Alzheimer’s as dark and scary – ‘a mind that’s 5 miles deep’. He tells his story because ‘if I’m not pushing forward … I’m falling backwards’. He’s eloquent and charming and tells a fascinating story. But it’s also incredibly sad, because he knows how it ends. 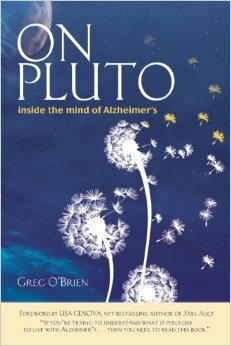 Greg has also written a book about his experience called On Pluto: Inside the Mind of Alzheimer’s. I’ve just bought it and will post more about it when I’ve read it. Listen to the podcast here. Buy Greg’s book here. This entry was posted in life, Uncategorized and tagged alzheimers, Greg O'Brien, Lea Thau, on pluto, podcast, serial, strangers by katierae. Bookmark the permalink.